Capsule Summary: Radar writes a letter home, telling his mother about helping Hawkeye inspect feet, a North Korean eating at the Mess Tent, B.J. getting hoodwinked, and more. This is the third and last letter home episode from Season 4, after “Dear Mildred” and “Dear Peggy.” As is the case with most letter home episodes, viewers must willingly suspend their disbelief and accept that Radar has been told about events he didn’t personally witness (like B.J. and the watch). There are some issues with Radar’s letter. I realize that by Season 4, his character had changed significantly, becoming far more innocent and naive. But his line about writing slow because his mother can’t read fast? That’s not innocent or naive or funny–that’s painful. Much better is the revelation that he used to blame his father for dying when he was young. Apparently, Radar eventually realized dying wasn’t his father’s idea. It’s believable and adds a little depth to the character, particularly given his relationships with Colonels Blake and Potter. This almost could’ve been a standalone B story in another episode. As is often the case, we only see Hawkeye inspecting members of the main cast rather than nurses or corpsman. At one point, Radar tells his mother there are 200 people in the 4077th, which equates to 20,000 toes. His math is off considerably here so perhaps he’s also wrong about the personnel count. We see Hawkeye inspect just six pairs of feet and they all have stories to tell. Colonel Potter learned about footcare from Truman; Margaret tries to hide her rendezvous with Frank; Klinger hopes to convince President Eisenhower to grant him a discharge; Father Mulcahy has a scar on his foot, courtesy of his sister; and Frank’s toes are painted red. Poor, naive B.J. I can’t figure out exactly how Sergeant Callan’s scam works. Where does he get watches without gears? Does he buy cheap watches in bulk and remove the gears himself? If so, are the gears of a cheap watch worth enough for him to spend the time removing them? We never learn if B.J. gets his money back. This doesn’t ring true for me. Frank has enough experience with the South Korean military to know better than to tackle someone just because they’re speaking Korean. He’s not that stupid. I’m surprised he didn’t post MPs at the Mess Tent and ask for identification. Who exactly told Radar that Colonel Potter was killed? Margaret and Potter roll up in their jeep and a minute later Radar runs outside to see what’s going on. Did Klinger talk to Radar while running to get help? If so, why did he tell Radar that Colonel Potter was dead? Also, there seems to be quite a lot of blood on Potter’s pants. There’s no mention of a Purple Heart. Finally, are we supposed to assume that Potter was shot by the same North Korean sniper Radar encountered in the Mess Tent? I think that’s it. Have I missed anything? 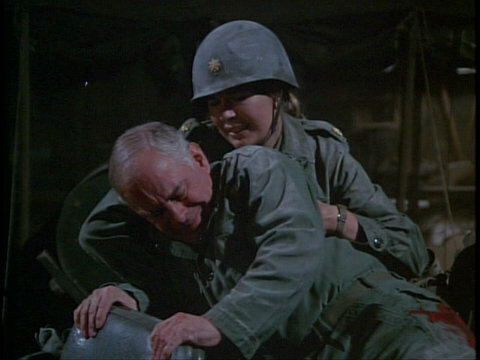 Margaret tends to a wounded Colonel Potter. Frank’s obsession with whitewashing the rocks in camp is first shown in “The Trial of Henry Blake” during Season 2. Also, Frank has had his hand twisted at least once before, by Colonel Buzz Brighton in “The Ringbanger” during Season 1. Does Radar’s makeshift fridge show up in any other episodes? He made it out of shipping crate intended for human blood. Likewise, is there always a bottle opener next to the door and I’ve just never seen it before? What exactly is the point of Goldman saluting Hawkeye next to the Swamp? Hawkeye says “You better be prepared to explain that” and then Goldman walks past B.J. Am I missing something? Is it just another example of how little Hawkeye cares for Army discipline? There’s a certain feeling about this episode (as well as Season 4 in general) that almost has a simple, relaxed, and almost kind of “homey” feel to it, and I think that largely has to do with Jim Fritzell & Everett Greenbaum having been regular writers on THE ANDY GRIFFITH SHOW (and they were apparently both Andy and Don Knotts’ favorite writers on the show). And yes, I too assume that, for whatever reason, Klinger must have said something briefly to Radar about what happened to Potter when he ran off for help. An entertaining episode and a funny one, especially Frank’s misguided attempt to accost what he thought was a North Korean. Frank: Touch my toes and I’ll have you killed then court-martialed! A perfect example of Frank’s verbal short comings. Hawkeye: There was a parade on 5th Avenue. The sons and daughters of Mickey Rooney. I don’t get the joke at all. Did he really have so many children they could form a parade? Radar mentions that he ‘finally’ got a pet — Dopey the GuenaPig . What did he consider all the animals that Col Blake let him keep? How did a North Korean get past the camp MPs? Klinger’s remarks were directed at General Matthew Ridgeway, who arrived in Korea in 1951, however BJ didn’t arrive until September 1952.